Watching the video below makes me realize how much deer hunters / coyote hunters help to increase biodiversity in forests. While the video above focuses more on the impact of wolves on overly rampant deer populations, it also makes reference to coyotes being a problem for biodiversity too. 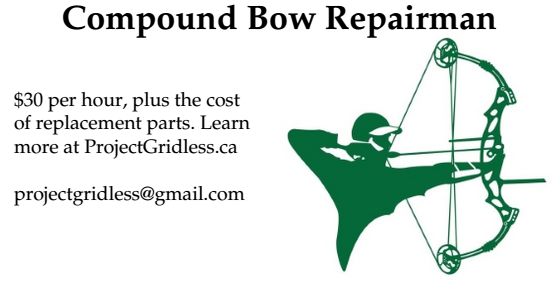 In Ontario we have a growing deer problem, which is being managed through deer hunting by rifle hunters, black powder hunters and bowhunters - however we have a growing problem with coyotes (and coyote wolf hybrids - sometimes called coywolves or coywolf), which means we need more hunters killing coyotes. Northern Ontario already has wolves, which oddly enough is part of the problem because they are crossbreeding with coyotes and creating a killer hybrid. Wolves hunt in packs, but don't attack humans - and when they make a kill the pack eats the whole carcass. Coyotes sometimes hunt in packs, but they do attack humans (especially small children) - and when they make a kill they eat part of it and leave it for the scavengers. Coyote-Wolf Hybrids hunt in packs, attack humans, and like coyotes, they kill and don't even eat the carcass. Such is the situation that entire deer populations in certain parts of Ontario have been completely wiped out due to packs of hybrids attacking herds of deer, killing the whole herd, only eating a tiny bit and then moving on to find another herd of deer to kill. Hybrids are basically just killer packs that roam the region killing everything they can find. 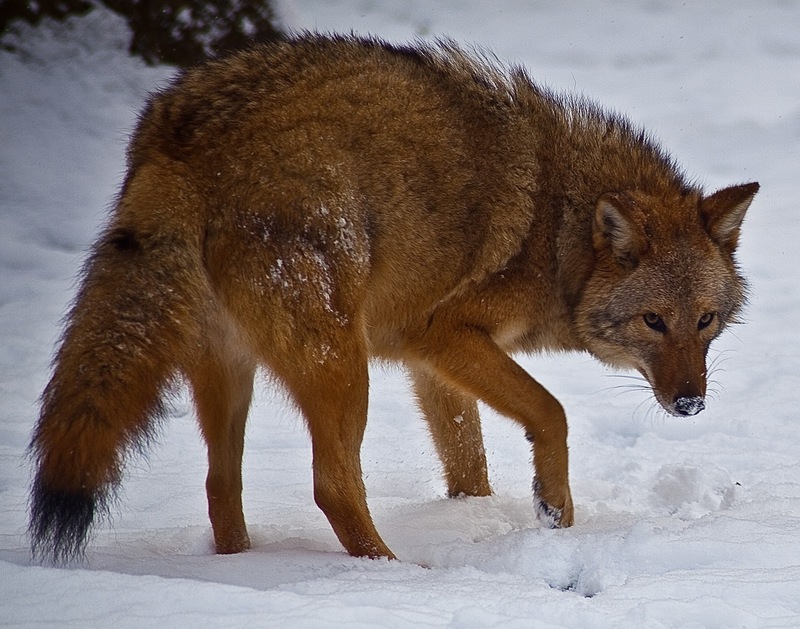 Including humans, which are more often to be seen as possible prey by a hybrid because hybrids are much bigger than normal coyotes. The odd thing however is that Coyote-Wolf Hybrids fall into a legal gray area. 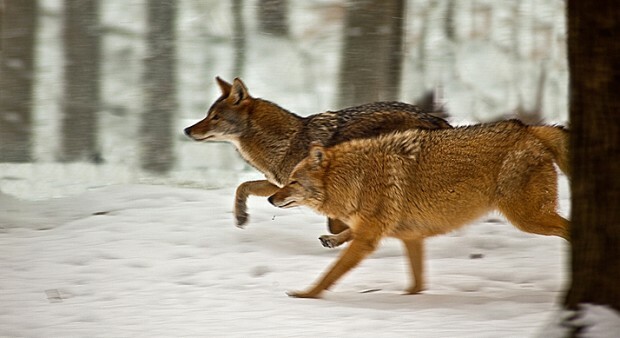 They are not coyotes, which are governed by the $10 per hunting tag as per Ontario law. And they are not wolves either. There is no law governing the hybrids, they are basically a completely separate species as far as the law is concerned. So can people hunt the hybrids? Maybe. It is rather unclear. There is no law saying you cannot hunt the hybrids. But there are no laws saying you can either. And if you do so, are you using a wolf hunting tag or a coyote hunting tag? Or should there be special hybrid tags??? 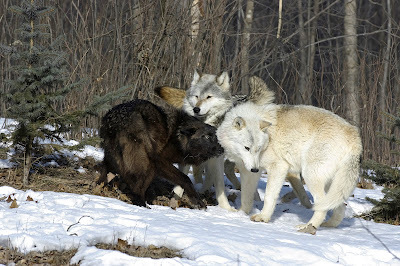 Whereas normal wolves in Ontario have a much more distinctive white, grey or black appearance, often couples with a wider bushier face. They are also physically bigger. 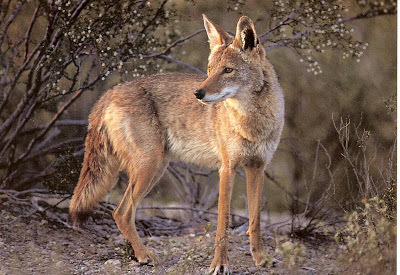 Purebred coyotes in contrast are skinnier, have longer noses, reddish-brown with white-grey on the bellies. The length of their fur varies on the season, but they often have noticeably less fur than a wolf or a hybrid. Due to their smaller stature normal coyotes rarely attack humans. 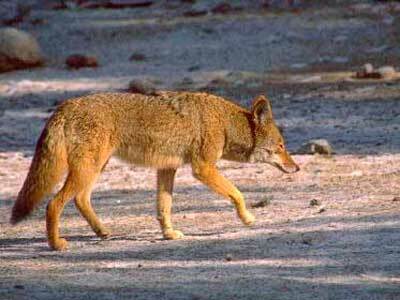 Purebred coyotes normally hunt rodents and are only a danger to small children. Seeing the images above it becomes easy to tell the two species apart from the hybrids. Please note there will also sometimes be hybrids that are closer to being 3/4 wolf or 3/4 coyote, but they are equally dangerous to anything they consider to be prey. In Toronto (2013) a coyote hybrid was shot by Toronto police in the community of Cabbagetown, an inner city suburb remarkably close to the downtown core. In 2009 a young woman from Toronto was attacked and killed in Cape Breton Highlands National Park by a pack of coyote hybrids. She suffered multiple bites from the pack and died of blood loss. 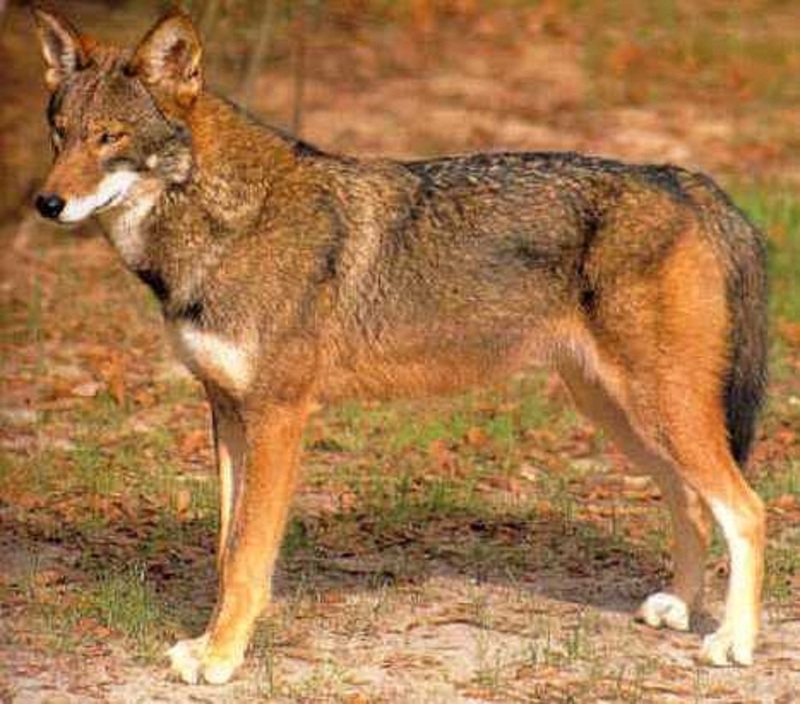 January 2012, a coyote hybrid attacked an eight-year-old Oakville, Ontario girl. She survived because she managed to get to their safety of her house. September 2013, in St. Catharines, Ontario, a coyote attacked an 8-year-old girl. She survived because her stepfather fought the beast off. June 2014, in Thornhill, Ontario, two adult women were attacked by two coyote hybrids. Earlier the same day, the same two coyotes had tried to attack at least three other adults who escaped to safety. July 2014, in Gravenhurst, Ontario, a woman was exercising her two American Bulldogs when she was attacked by a coyote hybrid. She and her dogs survived. Missing persons who disappear in the Ontario wilderness are chalked up by police as unsolved missing person cases and their bodies are often not found, the cause of their deaths are unknown. Attacks by predators or packs of predators make up a percentage of those cases, but the exact numbers are unknown. Susan Fleming, the producer and director of "Meet the Coywolf" thinks people should not panic or worry about the growing problem of coyote hybrids. She feels education is necessary and that hunting the new species is not necessary - even though the hybrid species is completely eradicating deer in some regions and are attacking humans. Susan Fleming probably has a very closed mind on the idea of hunting animals for the purposes of culling a species that has become dangerously over-populated and has no natural predators to keep it in check. Anti-hunting activists will never understand the need to deliberately cull a dangerous predator. Wildlife management is a necessity when a new dangerous predator emerges and has no natural predators that can keep its numbers at bay. If the only predator capable of dealing with coyote hybrids is humans, logic dictates that humans have to hunt the hybrid.